What happens when a plant pathogen invades a new continent brimming with potential victims? Australia is set to find out, as myrtle rust spreads within the country’s dominant plant family – the Myrtaceae. Leaf of broad-leaved paperbark on NSW’s north coast infected with myrtle rust. In 1973, a rust disease killed swathes of young flooded gums (Eucalyptus grandis) in plantations and nurseries in Brazil. A few plant pathologists started worrying about what would happen if this fungus or its relatives reached Australia, home of the gum tree. In April 2010, unusual leaf blotches on plants in a New South Wales nursery signalled the pathogen’s arrival. Out checking eucalypt plantations for disease, Dr Angus Carnegie – a forest pathologist with the NSW Government – received a message to drop everything. ‘This was the disease we’d been waiting for but hoping would never arrive,’ Dr Carnegie says. Although fungal experts agree that the rust invading Australia is a member of the eucalyptus/guava rust complex (Puccinia psidii), it has been officially designated a separate species called myrtle rust (Uredo rangelii). The Australian invader differs from eucalyptus rust in the structure of one of its spore types, but no genetic differences have been found.5 The Australian government is funding work to resolve relationships within the eucalyptus rust complex. Different members of the complex infect overlapping suites of Myrtaceae species with varying severity. However, adds Dr Morin, this wide host range ‘may not be realised in the field’. Although most of the 2200 Australian Myrtaceae species may be susceptible, the disease can develop only in actively growing shoots, in the presence of sufficient infective spores and conducive climatic conditions. CSIRO ecologist Dr Darren Kriticos has used the rust’s overseas distribution and known temperature and moisture requirements to map the areas at risk. The rust requires at least three hours of leaf moisture to germinate, and grows best between 14 and 25°C. Areas east of the Great Divide are most at risk. ‘Future climate change will extend the areas at risk in southern Australia, significantly increasing the risk to Tasmania,’ says Dr Kriticos. Climate suitability map for myrtle rust (CLIMEX Ecoclimatic Index). 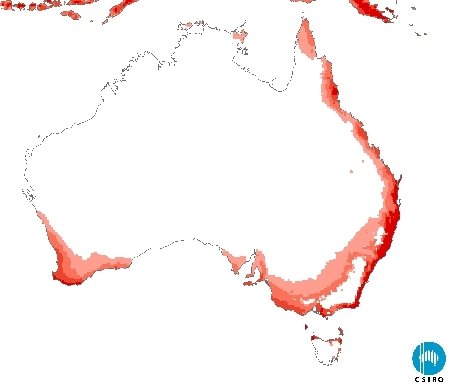 Darker red areas indicate higher climate suitability. With microscopic spores that float in the wind there is nothing to stop the spread of myrtle rust in eastern Australia, but its spread to Western Australia may be slowed by quarantine measures, helped by the fact that the prevailing winds typically blow from the west. With a favourable climate and a plethora of hosts, myrtle rust should thrive in Australia. But whether the rust is dire for plants and ecosystems will depend on the severity of infection and extent of resistance. 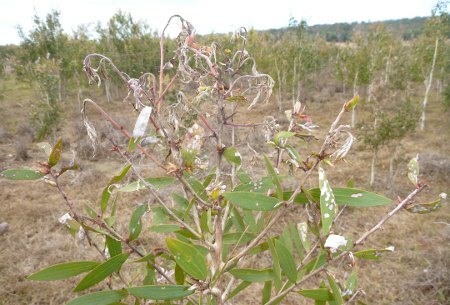 Eucalyptus rusts are primarily debilitators – stunting plant growth, compromising reproduction and rendering them vulnerable to infection by other pathogens. They attack growing tissues such as young leaves and stems, and sometimes flower buds and fruits. Seedlings often die, but mature plants survive, unless they are infected year after year and depleted of energy reserves. ‘It’s only been a few months, but already we have seen severe impacts on a few species, including shoot death, fruit collapse and seedling death, and impacts on stands across many localities,’ Dr Carnegie says. Of host species showing moderate to severe infection, some are rare (the endangered Rhodamnia angustifolia), some are ecologically important (broad-leaved paperbarks, the nectar of which feeds lots of wildlife) and some are economically valuable (crops of aniseed myrtle and lemon myrtle). Regenerating broad-leaved paperbark on NSW’s north coast infected with myrtle rust, July 2011. The rust’s greatest impact may be on plant succession – for particular species and for landscapes. Queensland government forest pathologist, Dr Geoff Pegg, warns that the rust could retard regeneration of key Myrtaceae species and reduce their ability to compete, resulting in dramatic changes in plant composition over large areas. ‘For example, Rhodomyrtus psidioides (native guava) has an important successional role in rainforest regeneration and is being badly affected by the rust,’ Dr Pegg says. Recent cooler, drier conditions have not halted its spread. ‘We thought it would slow much more than it has, but it continues to reproduce and infect new hosts,’ he adds. 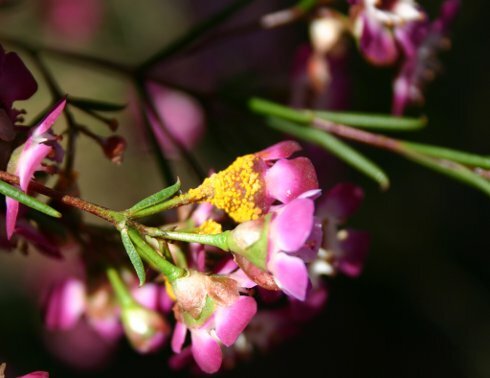 Flowers of Geraldton wax in Brisbane infected by myrtle rust. Geraldton wax is endemic to Western Australia but widely grown in gardens and for the cut flower trade. There is some hopeful news. In about two-thirds of the 118 taxa tested by CSIRO, only some individuals became infected. ‘This suggests that there could be some level of resistance present in many species,’ says Dr Morin. Brazilian plantations now use flooded gum clones containing resistance genes. CSIRO molecular biologist Dr Simon Southerton will investigate the potential for breeding resistant varieties of another important plantation tree, blue gum (Eucalyptus globulus). He suspects the same major resistance gene is widespread among eucalypts, and could be in other Myrtaceae. ‘It probably evolved in response to some other common pathogen in Australia,’ he says. Otherwise, ‘Australia appears to be a very nice place for myrtle rust,’ says CSIRO evolutionary ecologist Dr Peter Thrall. With different species to infect at different times, a pathogen can maintain and build infective spore levels. ‘Higher levels of inoculum can help a pathogen overcome general plant defences,’ adds Dr Thrall. There is much to be learned about plants and pathogens from this giant unplanned experiment, particularly if Australia is to protect its Myrtaceae-based industries and ecosystems. But, in contrast to diseases that deliver drama and dead bodies, investigating the insidious potential of myrtle rust is not high on the national agenda. ‘If Australians could gaze into a crystal ball and see the consequences 50 years from now, they might be clamouring for much more research into this disease,’ Dr Carnegie says. 1 Simpson J, Thomas K and Grgurinovic C (2006). Uredinales species pathogenic on species of Myrtaceae. Australasian Plant Pathology 35, 549–62. 2 The rust infects 86 Australian Myrtaceae species growing overseas. Carnegie AJ and Lidbetter JR. (2011). Rapidly expanding host range of Puccinia psidii sensu lato in Australia. Australasian Plant Pathology, in press. 3 Walker J. (1996). Biogeography of fungi with special reference to Australia, Fungi of Australia 1A, 263–320. CSIRO Publishing and Australian Biological Resources Study. 4 See http://www.outbreak.gov.au/pests_diseases/pests_diseases_plant/myrtle-rust/national_host_list.html for a list of plants infected (current to May 2011). 5 Carnegie A and Cooper K. (2011). Emergency response to the incursion of an exotic myrtaceous rust in Australia. Australasian Plant Pathology. DOI: 10.1007/s13313-011-0066-6. 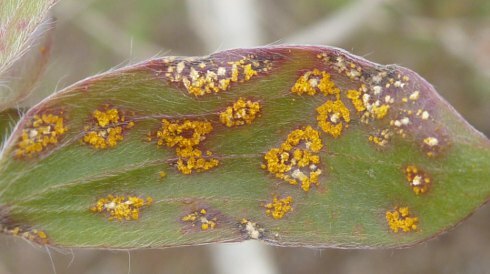 Carnegie and Cooper (2011) recommend that the rust be identified as eucalyptus rust (Puccinia psidii) on the basis that teliospores matching the description of P. psidii have been found, which means the rust should be referred to as a species of Puccinia, where the only name currently available is P. psidii. 6 Morin L, Aveyard R and Lidbetter J (2011). Myrtle rust: host testing under controlled conditions. CSIRO Ecosystem Services and NSW Department of Primary Industries. 7 Barrett L, Thrall P, Burdon J and Linde C (2008). Life-history determines genetic structure and evolutionary potential of host-parasite interactions. Trends in Ecology and Evolution 23, 678–85. 8 Graça R, Aun C, Guimarães L, Rodrigues B, Zauza E and Alfenas A (2011). A new race of Puccinia psidii defeats rust resistance in eucalypt. Australasian Plant Pathology. DOI: 10.1007/s13313-011-0056-8.